Comment: Fun, solid game with a few irritating bugs and lack of "moves list" for you to refer to. Made by indie game studio The Behemoth, Castle Crashers is their 1st console game, 2nd game overall. Flush with the success of Alien Hominid on Flash site Newgrounds, The Behemoth started development on Castle Crashers, releasing it on Xbox Live Arcade and (much much later) PlayStation Network. They are currently working on their 3rd game, BattleBlock Theatre. The key personnel in this small studio would be Dan Paladin (Art Director) and Tom Fulp (programmer, Founder and CEO of Newgrounds). Fans of flash game Alien Hominid would recognize Dan Paladin's trademark 2D style. The game is always busy, the screen always filled with colours, multiple spell effects, and several enemies. While the colourful palette might fool you into thinking this is a kid's game, a splash of bloody red might change your mind. This game is filled with bloody cartoon violence, with enemies splatting blood all over the place each time they are hit, or losing their heads when you finish them off with a powerful slash. Sometimes things get so busy that it becomes a little difficult to see what's going on. Luckily, the characters are brightly coloured and distinct, making it slightly easier to sort through the mayhem. The sound effects are good, and the music nice, but nothing special or outstanding. They are there as audio cues for you to attack, dodge, jump and violently decapitate you enemies. 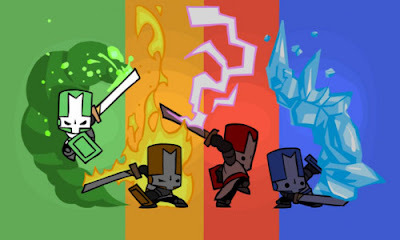 As a throwback to classic beat 'em ups, Castle Crashers has all the usual hooks; Plenty of enemies, item drops, some destructible environment. In addition to that, there are some RPG mechanics involved, allowing you to level up, distribute points to certain stats, learn new moves and new magic. When watching my friend play, I noticed he could do some of cool air combo where you launch enemies into the air and continue attacking them midair for several hits. It was a move that I had also unlocked but did not notice the instructions that flashed on the screen when I first acquired it. We could not find anywhere else in the game that listed all the moves and magic I had learned. Also, characters tend to get stuck if you stick to the bottom of the screen just before a cut scene starts. On the bright side, it was fun trying out different button combinations and discovering cool new moves, and restarting levels was not very painful (on Normal difficulty at least). The single player experience is quite solid, but you get the most fun and chaos out of playing co-op with your friends. Other players joining the game could choose from a wide variety of different characters (all with same meelee attacks, but different magic). At lower levels, it's fun role playing different RPG stereotypes, becoming a tank because of your high defense rating to shield your high agility friend who sits back and fire very powerful arrows. The single player portion requires about 3+ hours to complete. The game, however, is infinitely replayable as you try out new characters or go in again with your higher-level character. The level caps out at 100, the first 20 levels or so acquired through your first play-through of the campaign. Other multiplayer modes include a Volleyball mini-game and the Arena where you have to survive wave after wave of enemies. The game typically retails for USD 15 on both Xbox Live Arcade and PlayStation Network. Probably one of the most worthwhile games to buy on those download services. Castle Crashers takes a classic formula and spruces it up with a healthy dose of RPG. It works, it is not too expensive, and it is addictively fun! Note: I think I'll do all future game reviews this way. A lot easier to start writing with this layout.